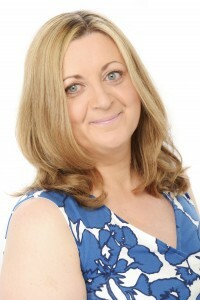 I’m delighted to welcome fellow Accent Press author, Marie Laval, back to my site to talk about her new release, The Lion’s Embrace. I have to say, it sounds fascinating. Thank you very much Jenny for welcoming me on your blog today to talk about my latest release. THE LION’S EMBRACE is my second historical romance and takes place mostly in North Africa, in Algeria to be exact, in 1845. Lucas Saintclair is hired as a guide by Harriet Montague to rescue her father, a British Museum archaeologist, who she believes was captured by a gang of Tuaregs in the far South of the country. 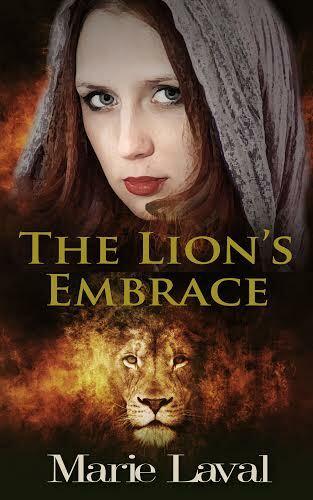 Writing THE LION’S EMBRACE was a fascinating process, not only because I got to fall in love with my hero (I know, it sounds very, very corny, but it’s true! 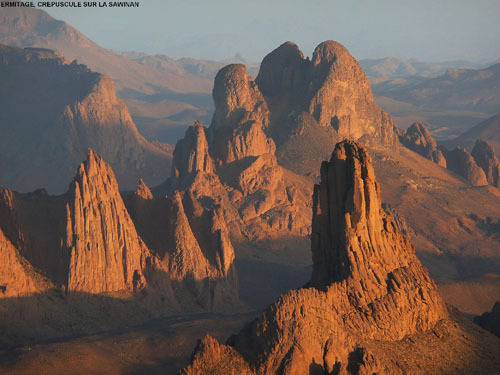 ), but also because I discovered the beautiful landscapes Lucas and Harriet travelled through on their way to Tamanrasset, and the culture of the people they encountered. 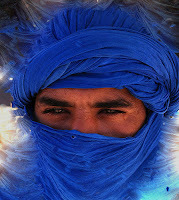 One particular group of people are at the centre of the plot: the Tuaregs, also called ‘The People of the Veil’ or the ‘Blue Men of the Desert’ because of the indigo veil all men have to wear from around the age of fifteen. I surrounded myself with photos of the Sahara, of oases and the magnificent Hoggar mountain range. I read Tuareg poems and stories and listened to music so that I could get a real ‘feel’ for the place and the people since I couldn’t travel there myself. One song in particular caught my imagination and I played it over and over again as I wrote THE LION’S EMBRACE. It’s a modern song and I have no idea what they are singing about, but I find the melody poignant and haunting, especially the monochord violin, the imzad, which can be heard throughout. 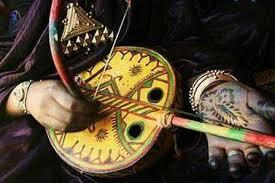 The imzad is a traditional Tuareg instrument only played by women. It is at the heart of the Tuareg culture and society because of its link to the Achak, the code of honour every Tuareg must live by. Those who stray from the path and commit dishonourable acts are said to have lost the ability to ‘hear the imzad’ in their heart and are therefore cast out of their family and their tribe. As they travel across the Sahara desert, Lucas Saintclair and Harriet Montague spend a few days with a Tuareg caravan. Every evening, they sit under the stars and listen to musicians playing the imzad and to stories and poems. The story-teller pulls out round pebbles out of his ‘bag of tales’, which is a skin pouch. Each pebble represents a different story and he tells the stories in the order the pebbles were drawn from the bag. This is an excerpt from THE LION’S EMBRACE when Lucas and Harriet are at the Tuareg camp. The tale is based on a genuine Tuareg story. The women played their instruments all along, drawing long, monochord sounds that at times sounded almost like laments and perfectly matched the mood of the audience, silent and attentive under the starry sky. By the end of the evening, Harriet shivered with cold. Lucas wrapped his arm around her shoulders to keep her warm. Despite his slightly mocking tone, the words made her dreamy. 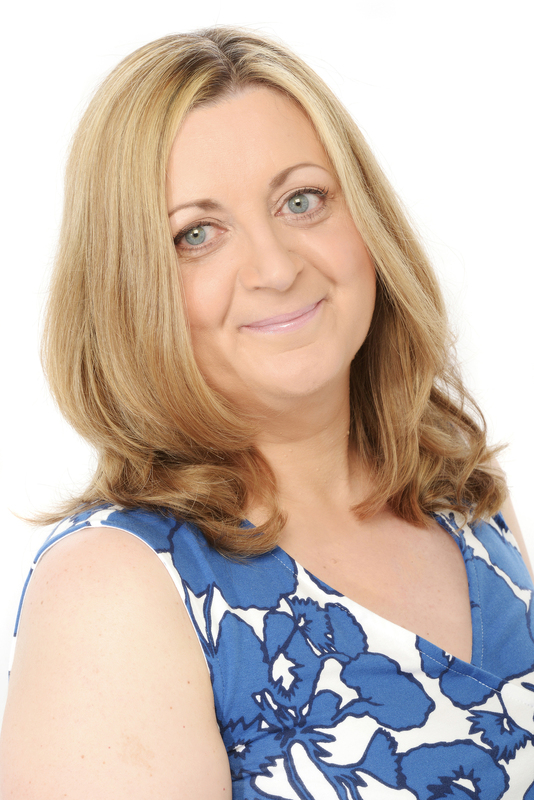 Thank you again Jenny for welcoming me on your blog. Arrogant, selfish and dangerous, Lucas Saintclair is everything Harriet Montague dislikes in a man. He is also the best guide in the whole of the Barbary States, the only man who can rescue her archaeologist father from the gang of Tuareg fighters that has kidnapped him. As Harriet embarks on a perilous journey across Algeria with Saintclair and Archibald Drake, her father’s most trusted friend, she discovers a bewitching but brutal land where nothing is what it seems. Who are these men intent on stealing her father’s ransom? What was her father hoping to find in Tuareg queen Tin Hinan’s tomb? Is Lucas Saintclair really as callous as he claims—or is he a man haunted by a past he cannot forgive? Dangerous passions engulf Harriet’s heart in the heat of the Sahara. Secrets of lost treasures, rebel fighters, and a sinister criminal brotherhood threaten her life and the life of the man she loves. Does forever lie in the lion’s embrace? Many thanks to Marie for such an interesting blog. Another book to add to my ‘to read’ list! Thank you for visiting, Jane, and for your kind comments. I am delighted to you enjoy the post! Thank you very much for hosting me today, Jenny!